Education about the wonder and beauty of elephants is key to their survival. To this end we have developed a show called "The Wonders of Elephants". It is being performed in schools, churches and libraries in America, Europe, Asia and Africa. It is a tool to create a cultural bridge between children of many countries, united by the common cause to save elephants. Through this show we are building an awareness in future generations of the necessity to protect and preserve elephants. Kristal Parks, M.A., brings together her twelve years as a children's entertainer, two decades as an international human rights/peace activist, academic training in biology and a profound love of elephants to create this uniquely entertaining and educational show. 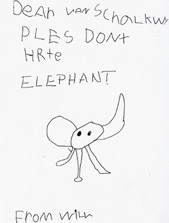 The International Children's Campaign to Save Elephants gives children an opportunity to do something to help threatened elephants. Below are samples of letters that have been written to Minister Marthinus van Schalkwyk of South Africa. SA is threatening to slaughter thousands of their Kruger Park elephants. Pachyderm Power! 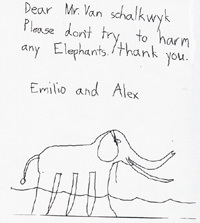 Speaks to School Children in Kenya about Elephants!! 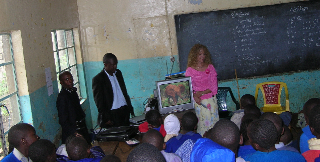 Doing a classroom presentation about elephants to Kenya students (many have never seen an elephant in the wild!!) We want to teach them about the beauty and wonder of their own natural wildlife resource so that they fall-in-love with elephants and not become poachers! This project needs your financial support. 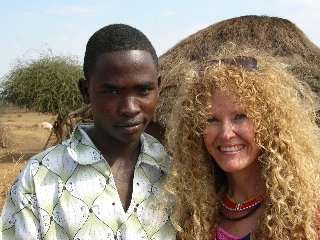 Pachyderm Power Begins School Sponsorship for Young Maasai!! The Maasai are traditional tribes people in Kenya. They live in the bush, in little huts with no electricity or water, however, they are the most wise and knowledgeable about the earth and wildlife because they live with them. My view is that the world desperately needs their wisdom to teach us how to live in harmony with nature. So, PP! is beginning a sponsorship program to help Maasai children go to school to learn English so that they can be the leaders in conservation. This young man, Samuel Lankoi, is our first to support. This project needs your financial support. Recently I had the pleasure of being an audience member for a captivating and enlightening show put on by Ms. Kristal Parks. I was amongst a roomful of wide-eyed 1st graders who sat spellbound; amazed by the vivid images shaped by this engaging and passionate storyteller. Very much attuned to that which captures the attention of youngsters, Ms. 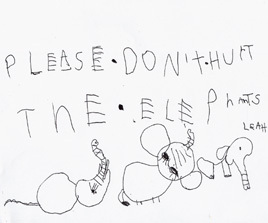 Parks told of the plight of the magnificent African elephant in a way easily understood by even the youngest listener. With patience, passion and kindness, her interactive presentation invited children to participate in enchanting magic tricks and charming songs. 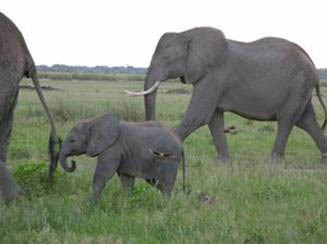 Children were encouraged not only to ask questions about these creatures who seem so very far removed from us, but also to share the knowledge they possess concerning elephants and their wild lives. By opening the hearts and minds of the children lucky enough to be touched by her presentation, she is bridging a gap centuries old between humans and the animals with whom we share this planet. 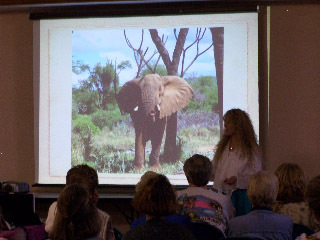 The positive energy and contagious enthusiasm of this presentation will surely help children to recognize the magnitude and splendor not only of elephants, but all animals. Ms. Parks is devoted to animals and children everywhere; inspiring compassion in all with her selfless work. I highly recommend this show and applaud Ms. Parks for being the change we all wish to see in this world. One of the most magnificent of nature' creation - the elephants - revealed themselves to me in all their glory, and more than this, their humanity, or should I say, what our humanity should aspire to be. They seem to have all our benevolence and none of our malevolence, all our good and none of our evil, all our wisdom and none of our cunning. Our special grace within this amazing hour was Kristal Parks through whom the elephants gave their self-revelation. 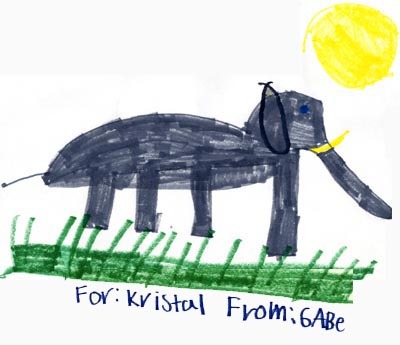 Kristal is the most pure-hearted soul in her love for the elephants I have personally encountered by far. At times there were dreamy smiles, at times there were tears in her eyes, and at times her engaging humor. There was magic in her show, but her greatest magic was to give me back my childhood for a timeless moment. 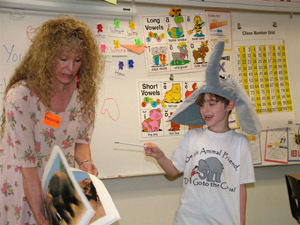 There would not be a single child in a single school who would not be enchanted by Kristal Parks and her beloved elephants. Your presentation to the Foundations of Peace and Justice class was outstanding. 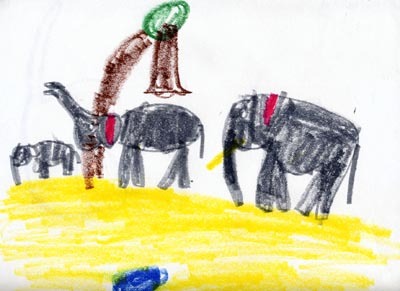 The students were engaged not only by your discussion of the treatment of elephants but by your integration of multiple perspectives and the use of stories to illustrate the situation. As an educator, I compliment you on the skill you brought to the class as you described very painful issues related to animal abuse, used graphic material appropriately, and offered alternatives to the violence. You informed us about action steps that are being promoted by organizations as well as your own work that offered the possibility for student involvement in the issue. Several students have commented since that they want to learn more about the current abuse of animals and also reflect on the spiritual connection that you mentioned. It was inspiring to hear your own journey and continued commitment to nonviolent action by going beyond the human family to include the animal world. You are a powerful witness for healing and peace building. Personally, you were wonderful.